The Primer DRYSTAR® road riding glove is constructed from a durable poly fabric main shell with leather reinforcements and incorporates an advanced polymer hard-knuckle protector which protects without compromising fit and flexibility. The Primer’s DRYSTAR® PERFORMANCE membrane means this glove is 100 per cent waterproof and breathable. Multi-panel main chassis consisting of stretch polyamide fabric and softshell on the backhand, with leather on palm and thumb. Synthetic suede reinforcements with foam padding on the palm and outer hand landing zone to provide abrasion resistance on key impact zones. PU-coated reinforcements on palm and thumb provides superior grip on bike’s controls. 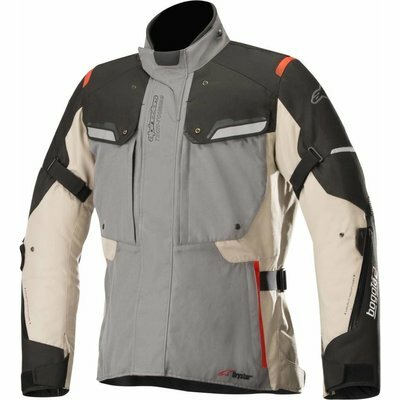 Incorporates Alpinestars’ waterproof DRYSTAR® PERFORMANCE sealed triple layer construction for a highly reduced material construction to promotes dexterity and sensitivity of bike controls. Incorporates insulating membrane (60g) for performance in colder climates. Advanced polymer over-molded hard knuckle protection offers class- leading protection without impairing hand flex or movement. Auto semi-lock zipper puller for personalization. Stretch panel on backhand and finger tips to increase flexibility and comfort. Touch screen compatible fingertips for use with GPS/smartphones. Convenient integrated visor wipe for cleaning eyewear. Long, gauntlet cuff construction with hook and loop grip closure. PRIMER DRYSTAR® GLOVE is CE certified level 1.